For all the appeal that comes with a $100-$150 Android tablet, experienced users are often quick to point out the omissions and holes. One particular detail that often comes up is the lack of Google Play and the growing library of apps. E FUN is no stranger to this as they have announced a number of devices over time, all of which are inexpensive options that don’t have Google Play. That is not the case with the new 7-inch model, the Nextbook Premium 7SE-GP. E FUN today announced a new $129.99 tablet for December which features specs that are surprisingly decent for the money. Details include a 7-inch 800×480 display, a 1GHz processor, 1GB RAM, HDMI-output, USB host, microSD expansion, and front-facing camera. Powered by Android 4.0 Ice Cream Sandwich, the Nextbook Premium 7SE-GP connects via Wi-Fi but also allows for 3G connectivity via dongle. Look for the 7-inch tablet to arrive some time in December, hopefully before Christmas. WEST COVINA, CA – November 27, 2012 – E FUN, a consumer electronics designer and manufacturer of fun, easy-to-use lifestyle products, announced today its newest Nextbook Android tablet featuring full access to Google Play™, the Nextbook Premium 7SE-GP. The 7” tablet includes improved features such as a 1GHz processor, 1GB DDR3 RAM, HDMI-out port, USB host port with 3G Dongle support, microSD slot and access to a full suite of Google apps. The Nextbook Premium 7SE-GP will be available in early December for the holiday season. Access to more than 600,000 apps and games, millions of songs and books, and thousands of movies in the Google Play store. Capability to read, listen and watch content not just on the Nextbook but on any device including a desktop, laptop or mobile phone with Google Play’s cloud feature. Access to Android apps from Google including Gmail™, Google Talk™, Google+™, Google Maps™, YouTube™ and much more. 5GB of free cloud storage with Google Drive™. 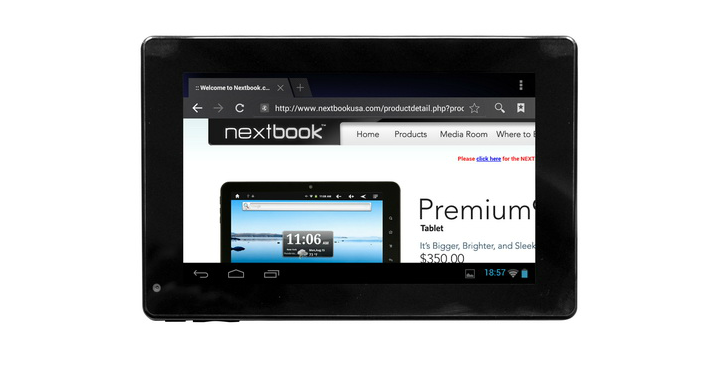 The Nextbook Premium 7SE-GP features a 7” five-finger multi-touch capacitive color screen and runs Android 4.0 Ice Cream Sandwich with a fast Amlogic A9 1GHz processor and 1GB DDR3 RAM. Additionally, it features a front-facing camera and a high-definition video player that can send a 1080p HD video to an HDTV or computer via the HDMI-out port. Nextbook Premium 7SE-GP users can now watch YouTube videos, listen to Internet music, receive and send e-mails, or simply browse the Internet from anywhere with both the built-in Wi-Fi connectivity or using a 3G dongle via the USB port with 3G dongle support. To keep all of a user’s files safely stored, the Nextbook Premium 7SE-GP includes 4GB of built-in flash memory, expandable both via the microSD slot (supporting SDHC cards up to 32GB) or via a USB flash drive in its full-sized USB host port. It has an 800×480 screen with 16:9 ratio and a G-sensor auto-rotate orientation feature for landscape or portrait viewing, as well as over-the-air (OTA) firmware update capabilities. The Nextbook Premium 7SE-GP is preloaded with a wide selection of applications including Net Nanny parental controls and CloudLink’s “Productivity Toolbox,” which includes numerous free applications such as 5GB of free cloud storage, free mobile security, wireless printing, and credit card processing. The new Nextbook Premium 7SE-GP will be available starting in December 2012 for $129.99 (MSRP). As its name implies, E FUN is a designer and marketer of fun, lifestyle e-products that are easily accessible. While appreciated by techies, E FUN products are primarily designed for consumers who desire the latest technological products, but are more concerned with what they do, not how they do it. E FUN’s ongoing product innovation focuses on making electronics and computing more fun! Initial products offerings from E FUN include the APEN digital pen and Nextbook Android tablets. E FUN is headquartered in West Covina, California.